The Tapestry Carpet Moth is quite small with their wingspan measuring around 14-19mm. These carpet moths will generally hop around on the floor and is rarely seen flying. The adult moths can be identified by their two-coloured wings - black towards the head and irredescent white behind. Adults are generally found in summer months, May - August. The Tapestry Carpet Moth (Trichophaga tapetzella) is most commonly found in summer months; however, with the advancements in insulation and central heating, moth infestations can now occur all year round. Keratin is their primary food source and can be found in animal skin, birds’ nests, fur, clothing and carpets, making homes a perfect breeding ground for carpet moths and their eggs and larvae. T It’s quite common to find larvae the same colour as your carpet as they will have eaten the dyed fibres within the carpet turning their colour identical to your carpet. Generally, carpet moths prefer to lay their eggs in undisturbed, dark areas, leading to infestations originating under furniture, along skirting boards and behind curtains. Most adult moths on our planet do not feed at all, carpet moths are no different. It’s only the larvae stage of the life cycle that feeds, causing destruction wherever they go. With the primary food source of this type of moth being keratin, both carpet and clothes moths larvae will feed on carpets and vice versa. Also, treating carpet and clothes moths is a very similar method using the same insecticides. Carpet moths can complete many lifecycles in a calendar year with females laying anywhere between 30 and 200 eggs at a time. The eggs will generally be laid in dark, cool areas in rugs, carpets and any other place where keratin is present. Normally they will dormant for roughly 10 days before hatching into the destructive larvae stage and sometimes can live for up to 2 years at this stage, often in cool winter months. The time scale of their development depends entirely upon their surroundings, so the humidity, heat, food source are all determents of the life span and cycle of a carpet moth. In the hot, humid summer they will pupate within 8 weeks of hatching, resulting in numerous generations in a single summer, with larvae destroying carpets as they grow. Adult carpet moths live only to lay their eggs, so once they have done this they will usually die a short time after. Small, bare patches in carpets are a clear indication of carpet moths and their larvae being present. Without proper treatment with the correct chemicals the infestation will only get worse. Due to the sheer number of eggs an adult carpet moth can lay, infestations can quickly arise and can easily get out of control. In these instances a very thorough carpet moth treatment treatment is needed. Permetherin and Pyrethrum based fumigators are key, if you want to kill the adult moths. 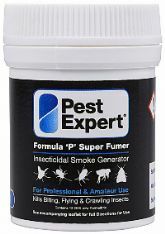 Our Pest Expert Formula 'P' Foggers and Pest Expert Formula 'P' Super Fumers contain the highest concentration of their relevant active ingredients meaning they are highly lethal to carpet moths. These fumigators are fantastic at killing at surface level but do not penetrate deep into carpets and rugs where moths may have laid eggs, so it is always advisable to use them as part of a strategy and not the full stragegy. So combining them with products such as Formula 'C' Carpet Moth Spray and Formula 'P' Carpet Moth Powder can help to penterate into areas the fumigator will not, also they will leave behind residual protection and help minimise the risk of re-infestation occuring. 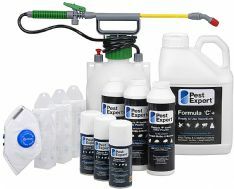 These products can be found in our Carpet Moth Treatment Kits. 1. Take children and/or pets out of the room prior to treatment. Cover or remove any fish tanks. 3. Once the powder has been removed, apply Formula 'C' Carpet Moth Spray to affected areas or the entire carpet if activity is widespread. Move any heavy furniture and spray beneath. A heavier application of spray should also be administered around the edges of the room (up to 50cm out from skirting boards/wall-floor junctions). This should save you the trouble of having to lift and treat beneath the edges of the carpet. A 1 litre container will treat approx 20 sq m.
4. If carpets are being discarded, once removed, liberally apply Formula ‘C’ and repeat process if infestation has been moderate to heavy. 5. Next, place the Formula ‘P’ Fogger in the centre of the room to be treated. Activate the Fogger by pushing down on the trigger to lock into place. 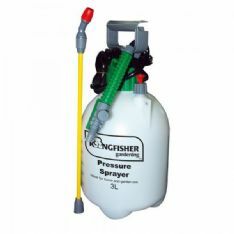 As the gas is released under high pressure, please hold the canister away from you when activating. The Fogger will take approx 90 seconds to release its contents. Each Fogger will treat a room of approx 4m x 4m. (Further info can be found by peeling back the canister label). 6. Close the room and allow 2-3 hours for surfaces to dry and for the gas to disperse. Upon re-entering the room, if possible ventilate by way of an open window to eliminate any related fumes, and help speed up the drying process. 7. To monitor activity after treatment install the moth trap(s) in the affected room(s). Fold the moth trap(s) into a toblerone shape and insert a pheremone pad into the trap, sticky side facing out. Replace the pad every 4-6 weeks. 8. Depending upon the degree of infestation, a second treatment may be necessary after 30 days. Our Standard Carpet Moth Killer Kit provides a collection of only the very best carpet moth control products, perfect for the treatment of one room with patchy carpet moth activity. 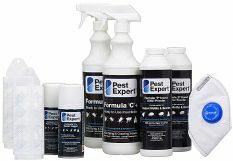 Incorporating premium grade, HSE-approved carpet moth killer products from market leaders Pest Expert, this kit provides everything you need to get rid of carpet moths. All our Carpet Moth Killer Kits are supplied with a step-by-step advice sheet to enable you to carry out a professional carpet moth treatment. For full details of this pack, please click on More Info. Pest Expert Formula 'C' is a fast-acting carpet moth spray that can be applied to carpets and rugs to kill carpet moths on contact. Formula 'C' also leaves behind an insecticidal residue that is effective for up to 12 weeks, offering long-lasting carpet moth control. (FROM JUST £7.49 WHEN BUYING MULTIPLES!). Pest Expert Formula C is a fast-acting carpet moth spray that can be applied to carpets and rugs to kill carpet moths on contact. Formula C also leaves behind an insecticidal residue that is effective for up to 12 weeks, offering long-lasting carpet moth control. This 5Ltr Formula 'C' Carpet Moth Spray has the ability to treat up to 125 sq mtrs in a single application! (FROM JUST £24.95 WHEN BUYING MULTIPLES!). Formula 'P' Carpet Moth Killer Powder from Pest Expert, has been specifically formulated to deliver a rapid knockdown and provide fast eradication of carpet moths. Now approved by the UK's HSE for both professional and amateur use, this unique product has the ability to control all life cycle stages of the carpet moth, including egg, larvae and adult moth. Large 300g pack size. Please Note: This product is now also included within all our Carpet Moth Killer Kits, superseding the old Rentokil 150g Insectrol powder. Pack of 10 replacement Pheromone Pads (Tineola species) for use with Demi Diamond Traps. These excellent moth pheromone traps attract clothes moths and will therefore help you both detect moth activity and monitor activity after treatment to ensure your moth infestation has been eradicated. Pest Expert Clothes Moth Killer Cassettes offer outstanding, long-lasting clothes moth protection, keeping clothing free from moth damage for up to 6 months. Odourless and non-staining, each twinpack protects a standard wardrobe for up to 6 months! 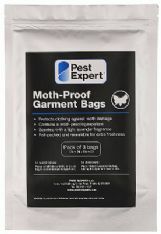 These Clothes Moth Killer Strips from Pest Expert are a highly effective moth control product, providing outstanding moth protection to your wardrobes and drawers over a 6 month period. Contain transfluthrin which kills clothes moths, eggs and larvae. 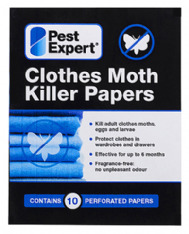 Pack of 10 individual moth killer papers. 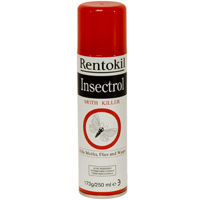 Rentokil Insectrol is a highly effective insecticidal moth killer spray. Designed to be used as a space spray this is an excellent product to form part of a comprehensive treatment for carpet moth infestation. 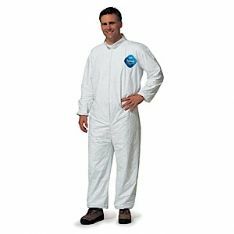 Protective Coveralls provide excellent protection to clothing and skin when applying insecticides. They will also protect you from contact with insects, thereby avoiding insect bites and possible transfer of insects on the clothing to other areas. 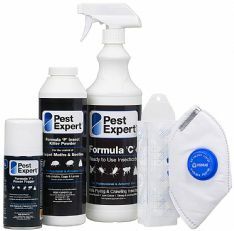 Highly recommended when treating moth infestations. 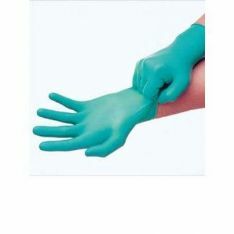 A top quality nitrile safety glove, offering excellent protection to the skin when carrying out an insecticidal treatment.